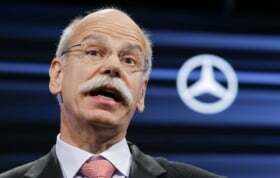 Europe's debt crisis may impact automakers, says Daimler CEO Dieter Zetsche. BRUSSELS - The Greek sovereign debt crisis may impact automakers through its effect on the euro and the availability of credit, Daimler CEO Dieter Zetsche said. Zetsche said companies who manufacture in Europe such as Daimler were affected by the debt crisis due to its potential effect on exchange rates. He said the industry is exposed to the crisis as far as exchange rates are concerned because "many of us have a significant part of production based in Europe." The euro has remained strong by historical standards against the dollar despite the EU's debt crisis, benefiting from interest rate differentials with the Unites States. But it has come off recent highs over the past month as expectations of a Greek debt restructuring have increased. Zetsche said the crisis may eventually impact the ability of companies to refinance their operations. "Ultimately (we would be worried) if we would see a risk scenario as far as resources are available for refinancing," he said. Zetsche spoke to Reuters on Thursday on the sidelines of an event organized by industry association ACEA in Brussels.